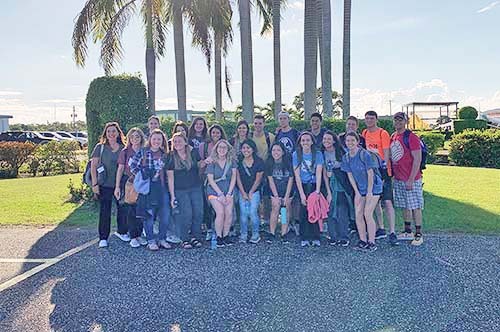 Students, faculty, and staff from College of the Ozarks traveled to Belize on a mission trip the week of Nov. 10-20, 2018. POINT LOOKOUT, MO. — College of the Ozarks students, faculty, and staff spent time serving others in Belize the week of Nov. 10-19, 2018. The College continued its investment in the rural communities of Belize through medical, educational, and discipleship initiatives. The students interacted with the Belizean people through educational instruction, community health outreach, and local church partnerships. During their time in Belize, C of O students participated in a myriad of activities with the townspeople from the Cayo District, a cultural-economic hub of western Belize. The College’s group taught students at the Billy White Primary School, led community health and training visits, and orchestrated an event to promote higher education. C of O students led the primary school in Bible lessons and worship services during their trip. The new addition of science experiment lessons brought an exciting view of education to the children. In addition to the educational activities, the students, staff, and faculty of C of O participated in community health activities. The people of Cayo were shown how to create toothpaste and hand sanitizer out of indigenous materials, and the psychological principles of empathy, kindness, and respect were taught to the Billy White students. College of the Ozarks selected three Billy White students to receive support in the way of school fees for next year. The criteria for selection was based on students who embodied the academic, cultural, patriotic, Christian, and vocational goals of the College. Education is not free nor paid for completely by the government in Belize, and lack of funds, sometimes as little as $25, can keep students from continuing their education. Phang explained she had come to know one of the primary school students, Elsy, who received funding to further her education into high school.